Kerington Bass is a senior at West Ouachita High School. She enjoys hunting, fishing, showing livestock, and spending time with her two sisters and dog. At her schools she is involved in Interact Club, the National Honor Society, and agriscience programs. In her chapter, she works in the school’s two greenhouses, participates in every CDE and proficiency award area that she can, and has served as a chapter officer for three years in a row. Some of the CDEs that she competes in include Forestry and Floriculture, while her SAEs are in Diversified Agriculture and Diversified Livestock. After high school, she plans on attending Louisiana Tech University to study agricultural education. She has always loved teaching her younger siblings and loves the idea of continuing the progression of agriculture and agricultural literacy. 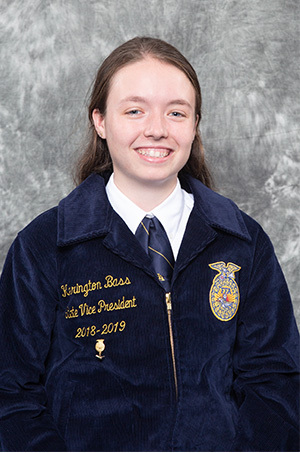 Kerington Bass is proud to serve as our 2018-2019 State FFA Vice President representing Area I.